After graduating from college, I had the desire to go off the beaten path, confront the world’s problems head on, and be the solution to the injustices to our country’s urban poor. Two years ago I packed up my belongings, left my suburban home of Middlesex, N.J., traveled down the New Jersey Turnpike until I arrived in Camden to begin my time as a Service Year Volunteer with DeSales Service Works (DSW). Within days of arriving, however, the expectations I held regarding my goals for coming to Camden were quickly challenged. During orientation, our program director told us we were not here to change or fix Camden, but instead we were to be compassionate witnesses to those we encountered during our service. With that, I slid off my high horse and began re-evaluating what I was actually doing in Camden. 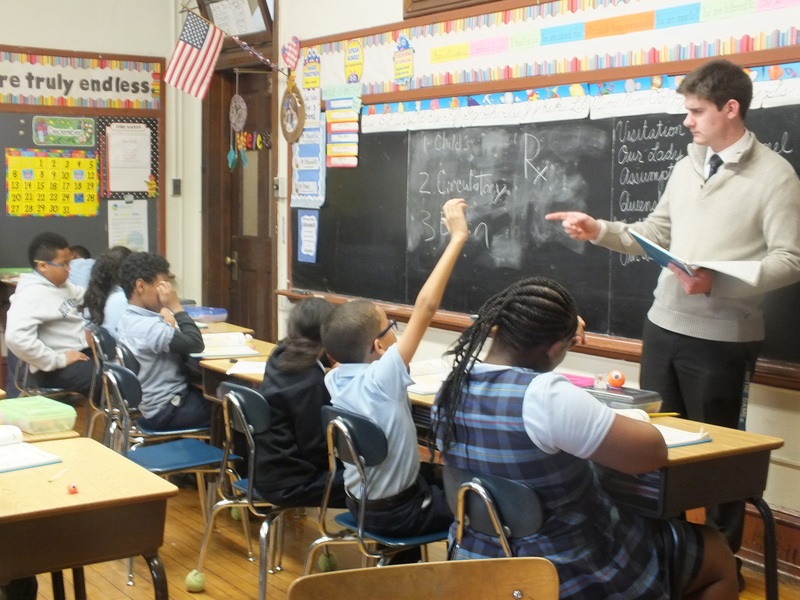 Ryan Langton, a Service Year Volunteer with DeSales Service Works, works with students at Holy Name School, Camden. DeSales Service Works is a volunteer organization that allows young adult volunteers to serve the marginalized in ministries that include schools, social service agencies, homeless shelters and medical clinics. Our patron, Saint Francis de Sales, believed that nothing was small in the service of God, and DSW is built around that guiding principle. I was placed at Guadalupe Family Services, working alongside many of Camden’s youth, teaching and tutoring them as part of a youth development program called CASA (Camden Adolescents Striving for Achievement). Working with youth and especially teens has opened my eyes to the obstacles they face growing up in a city like Camden and the will-power they possess to overcome these obstacles. In a city where less than 50 percent of residents have graduated high school as of 2012, I get to work with students who choose to walk to our office every day and better themselves. Some of these teens are the sons and daughters of recent immigrants. Many hope to be the first in their family to graduate high school and move on to college. All of them are teens who live in a city where access to academic and emotional support is not readily available and neighborhood violence can be frequent. Through tutoring, helping them with school work, preparing them for college applications, and listening to their experiences, I am able to offer support and resources to teens who would otherwise not have access to this support. I cannot fix all of their problems, or make the many obstacles to their success suddenly disappear. For the amount of time they spend in the office, however, I can assist them in their drive to succeed. I witness the determination and fortitude these Camden teens possess in wanting to become more than another statistic. I have not changed Camden, but I would like to think I have impacted the lives of the teens I have worked with, and I know for a fact that the Camden students I have met have changed mine. Since arriving here almost two years ago, I have seen different students succeed in their classes, graduate high school, move on to college, join the military, and find new opportunities working in fields that excite them. I have witnessed this thanks to DeSales Service Works. As a volunteer at DSW, I have experienced the hope and promise alive in the youth of Camden. I invite you to attend the second Annual DSW Summer Social fundraiser, not only to support DeSales Service Works but also to learn more about the hope that is thriving in the city of Camden. All of the proceeds from the event will support the good works of our Service Year Volunteers so we can continue serving those most in need. Join us at the Cathedral of the Immaculate Conception at 642 Market Street in Camden on June 10 from 5-9 p.m. For tickets, to donate, or sponsor the event, you can find our website at desalesservice.org. 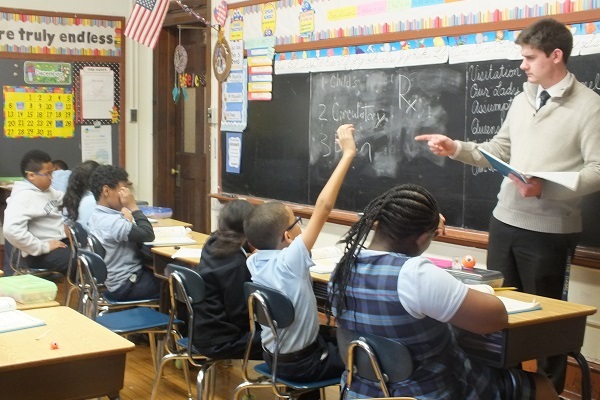 Ryan Langton, a Service Year Volunteer with DeSales Service Works, is currently serving in Camden City.